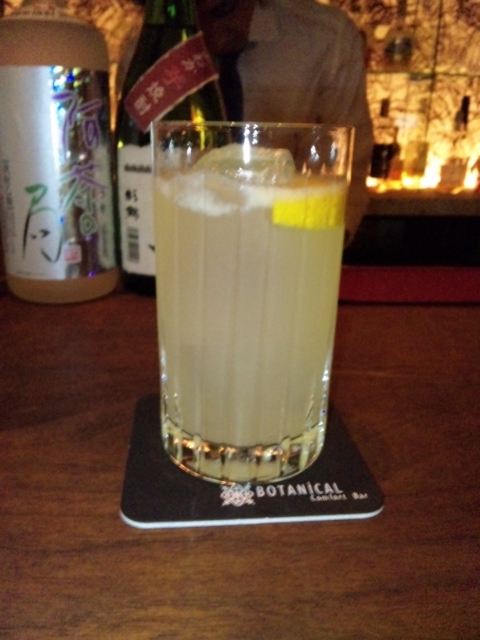 As promised, I’m starting this (hopefully long) series of cocktails concocted by Wataru Matsumoto, owner/bartender at BOTANICAL (Comfort bar) in Shiozuoka City. Mr. Matsumoto is only too happy to share his secrets. Haaru lemon is a Japanese brand of Meyer lemon, a very sweet lemon with an orange skin. -Cut out a wedge of the Haaru lemon. 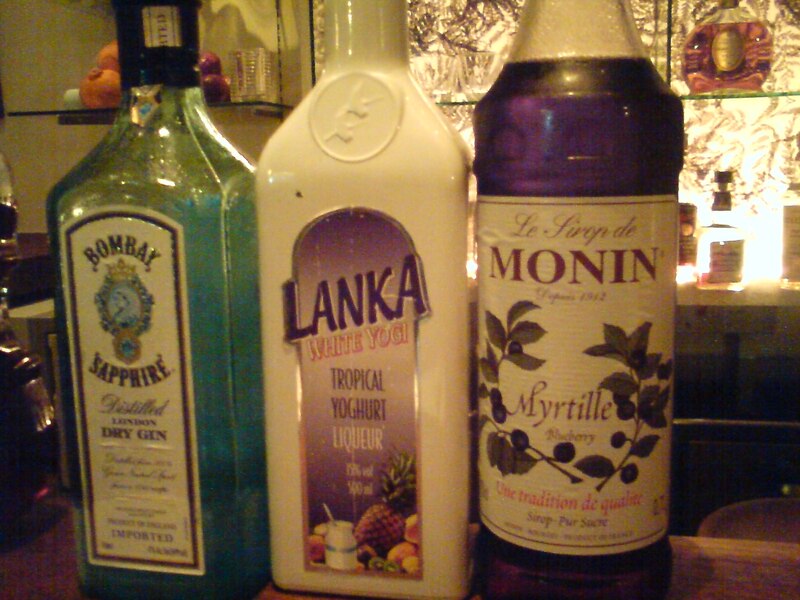 -In a shaker, press the rest of the Haaru lemon and pour the gin and syrup over enough ice. -Pour in a long glass over a large cube of ice. -Fill with mineral water. Stir gently. Add the lemon wedge and serve! Passion fruit is readily available in Japan as it is grown in Kyushu nad Okinawa Islands when not directly imported for Southern countries. It makes for great colours, taste and even give this little extra “crunch”! 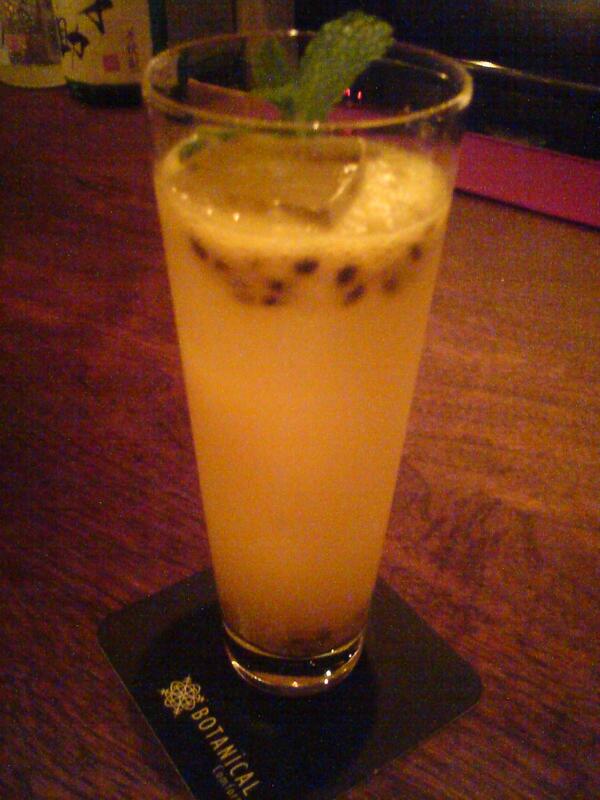 -Passion Fruit: a whole fresh fruit inside, seeds included. -Put everyjthing in a shaker with plenty of ice. -Serve in a long glass over a few cubes of ice and stir. Decorate with a fresh sprig of mint. 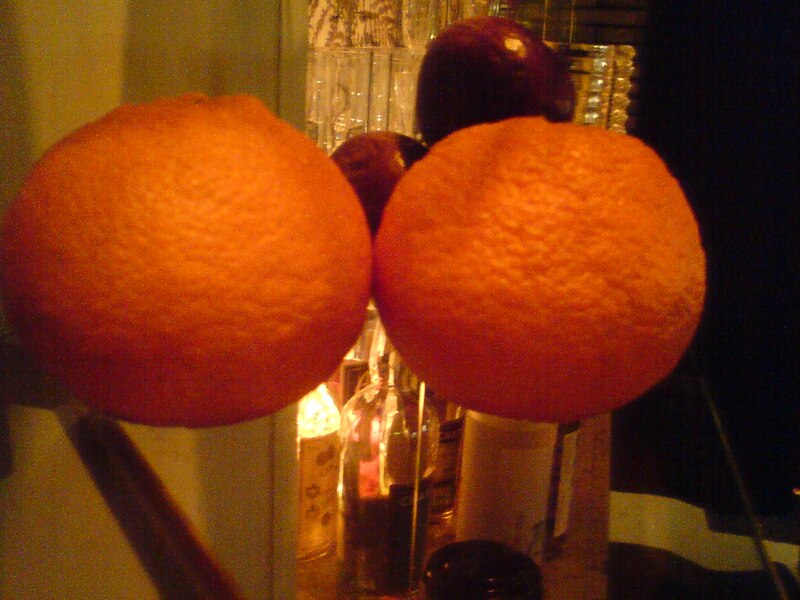 Kinkan/金柑 in Japanese means “Golden Orange” or kumquat! -Choose a long and fat glass. -Drop enough ice in the glasss. -Press the two slices of ginger. Pour the juice in the glass and drop the ginger slices in the glass, too. 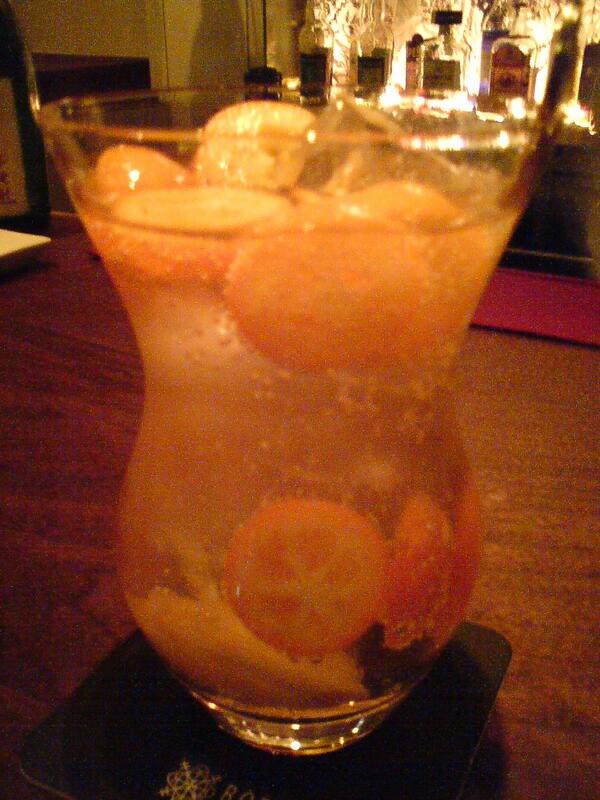 -Pour the gin in the glass. -Cut the kumquat in halves. squeeze them lightly over the glass before dropping them over the ice. 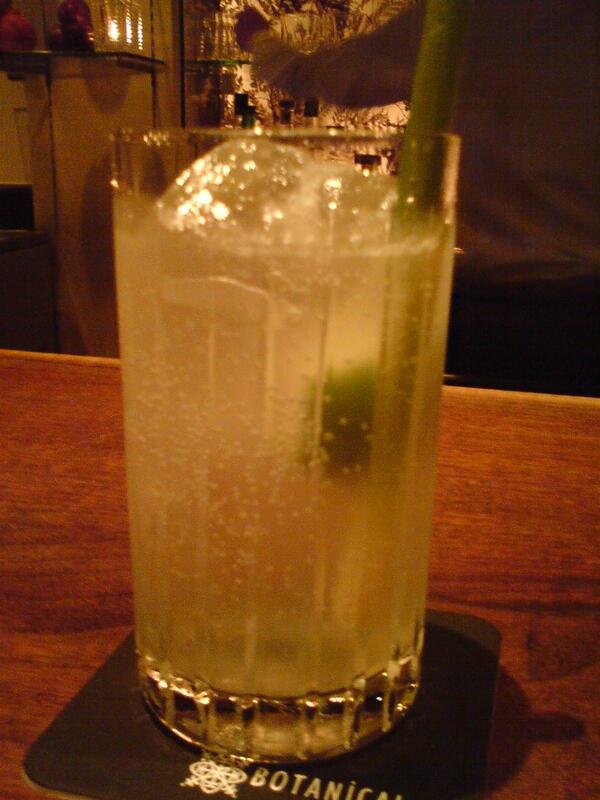 -Fill with Sweet Ginger Ale and stir again. As it is an “eatable” (Wataru Matsumoto’s words! ), serve with a long thin fork! 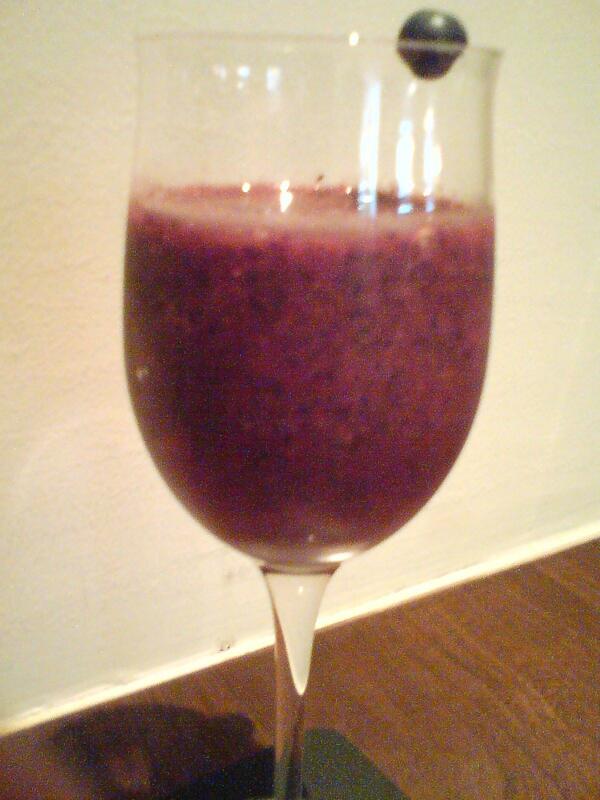 -Drop all ingredients in a food processor and turn until you obtain a rough kind of “smoothie”. -Pour in medium white wine glass. -Cut a large blueberry half way and “plant” it on the edge of the glass. Not as sweet as one would imagine, but still a dessert of a cocktail! 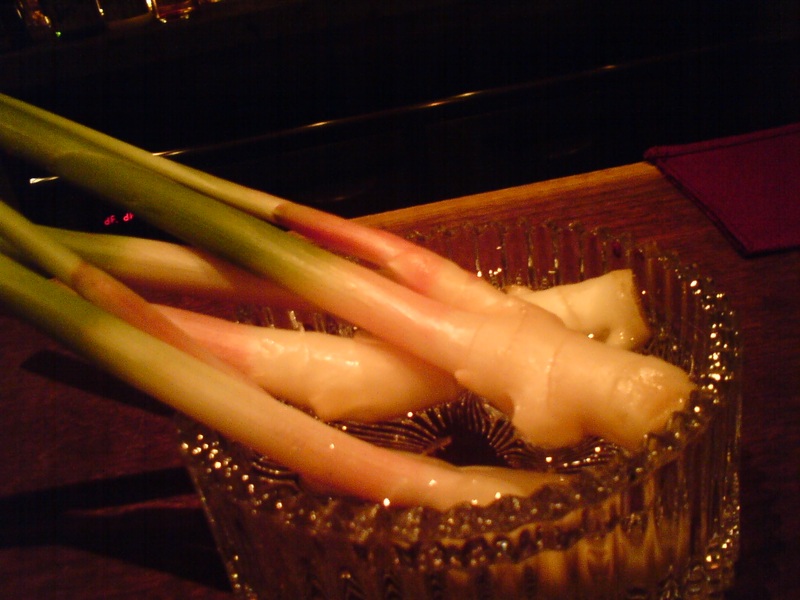 This “Ginger” is not really a “fresh fruit cocktail”, but the notion is the same as a fresh vegetable that is sometimes eaten as a sweet is included. It could also be called a variation of a Moscow Mule with the difference that ginger ale is replaced with fresh ginger and mineral water. -Grate the root part of the ginger and collect the juice. Cut off the stem as it will be used for decoration and as a stir utensil by the drinker. -Drop ice in a long glass. -Add ginger juice, lime juice, syrup and Smirnoff Vodka. -Add mineral water and stir gently. Serve with the stick ginger stem and a wedge of lime. 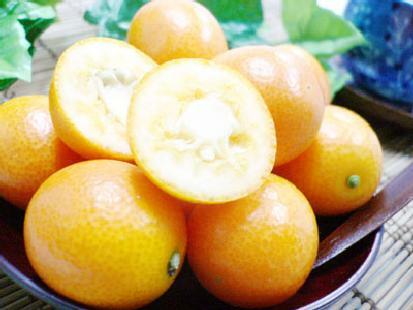 Dekopon (デコポン) is a seedless and highly sweet citrus fruit, a hybrid between Kiyomi and ponkan , developed in Japan in 1972. While dekopon was originally a brand name, it has become a genericized trademark and it is used to refer to all brands of the fruit; the generic name is shiranuhi or shiranui (不知火). Dekopon is quite distinctive due to its sweet taste, large size and the large protruding bump on the top of the fruit. In Brazil, dekopon is marketed under the brand name of Kinsei which derived from the Japanese word for Venus. Brazilian farmers have succeeded in adapting the variety to tropical to temperate climate in the highlands of São Paulo state. The work is done by Unkichi Taniwaki, a farmer of Japanese origin. Kinsei is easily harvested from May to September. In the high season for kinsei, each fruit costs around 0.50 USD at the Brazilian street market and supermarkets. In Korea, dekopon is called hallabong (한라봉) named after Hallasan the mountain located in Jeju-do, where it is primarily grown. 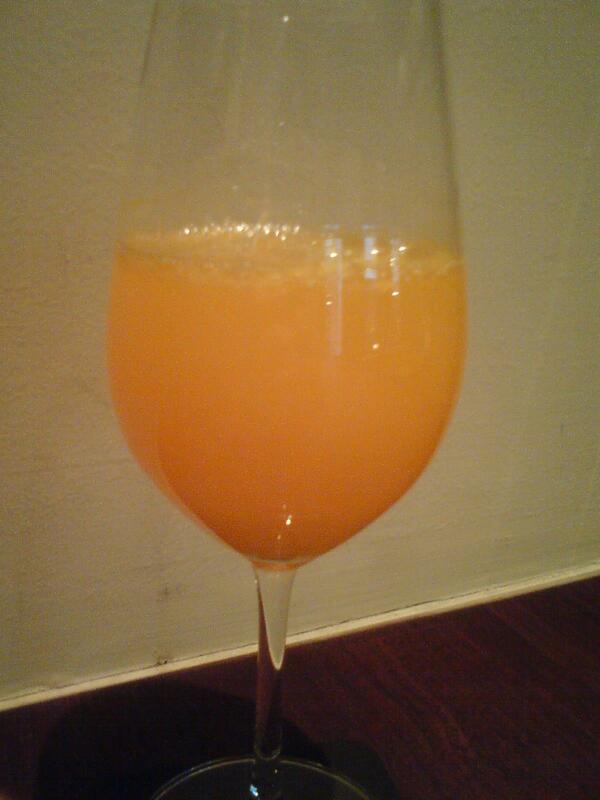 The following cocktail could also be named “Dekopon Mimosa”! -In a large mixing glass pour the freshly pressed dekpon juice over a large ice cube. Stir to chill the juice, then take out ice and discard. -Pour the juice in a wine glass. -Add chilled Mumm Champagne. Stir gently and serve. Makes for a great soft acidity! Thanks for the link to this page, Robert-Gilles! If the Haaru Lemon tastes anything like Lemon Drop cocktail then I know I’d enjoy it! Natsha is a good friend of mine!